Sketched Oct. 26, 1:44 p.m. 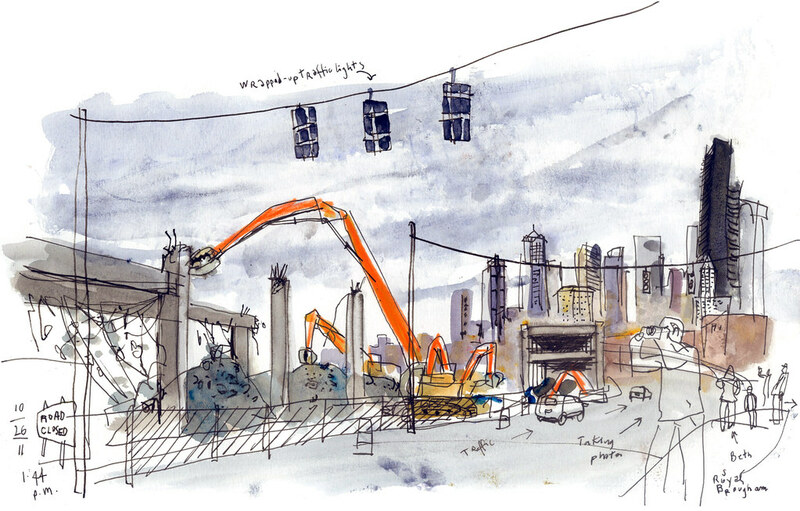 I don’t use the Viaduct for my regular commute, so I can’t say I missed driving on it last week, when it closed for several days during the first phase of its demolition. Did the hyped “Viadoom” slow you down? What really stuck with me on a visit to the demolition zone was how many people were there in the middle of the day, just watching the construction crews chip away at the concrete and taking photos. I spent about an hour or so and saw more than a dozen people come and go. Julie Newcombe, of Burien, had made a point to get out of her car this time after just driving by on previous days. She was upset to see the Viaduct being destroyed. It’s a mistake, she told me, because of the huge cost and because the new tunnel won’t provide access to downtown. 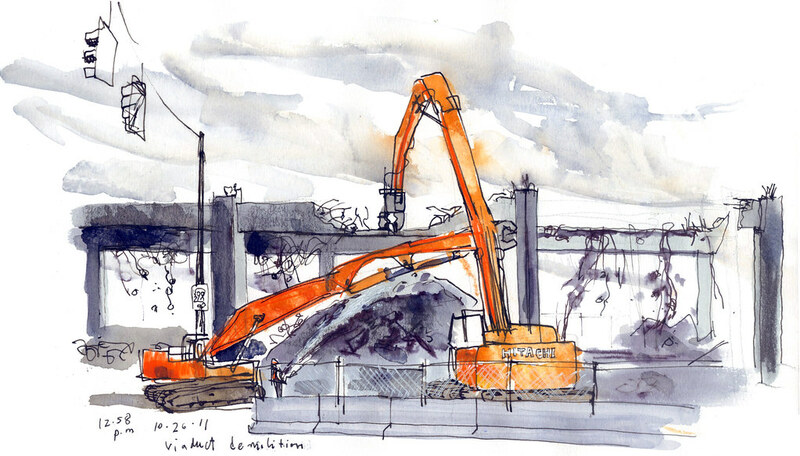 When asked about the Viaduct, others have told me that tearing it down is a mistake, especially when I spent a day walking under it back in September. But something makes Newcombe’s sentiment more poignant. When the 6.8 Nisqually earthquake shook it all up ten years ago, she was one of the people driving on it. “On Feb. 28, 2001, I was headed North on Hwy. 99 towards downtown Seattle. About 8 blocks south of the Seneca off-ramp, the left rear of my car dropped about a foot and I heard a loud clang of metal on metal. Flat tire was my first thought. Sketched Oct. 26, 12:58 p.m.